While some say it’s too hot to walk while playing golf in Thailand, I disagree! There are drink stations every three holes to top up the body up with fluids and high energy snacks & fruit and the light walking exercise is actually good for you. Walking the Thailand golf course also allows me to socialize with the other golfers in my foursome and develop a unique relationship with my Thai caddy, the later being something left unsaid or at least for another post. Let’s just say it is harder to socialise with others when using golf carts in Thailand. To make matters worse, most Thailand golf courses have a one golfer per cart policy, so if you choose to ride, you only get see your golfing buddies on the tee and green of each hole; certainly not the best time to socialize. Have you ever tried to talk in the middle of a crucial putt or during your opponent’s backswing on a tight driving hole? Try it and you will see how far it gets you! Another plus for walking Thailand golf courses is that I can better appreciate the design of the courses. From cart level most Bangkok golf courses seem flat. When walking I can the subtle breaks and contours of the golf course and green. This allows me to be sure of how my putts will break as I can see the big picture around where my ball rests. There is one more point that I must mention. Have you ever hit a bad shot golfing in Thailand and wanted to just “vent” your frustration? Walking allows me the time to let of some steam, put any bad thoughts away, and refocus on the present (my next shot). When I ride, it seems that my time is so rushed that I do not get out of the bad frame of mind and just dwell on the past mistake even when hitting the next shot. The later is definitely not recommended to recover and score well. 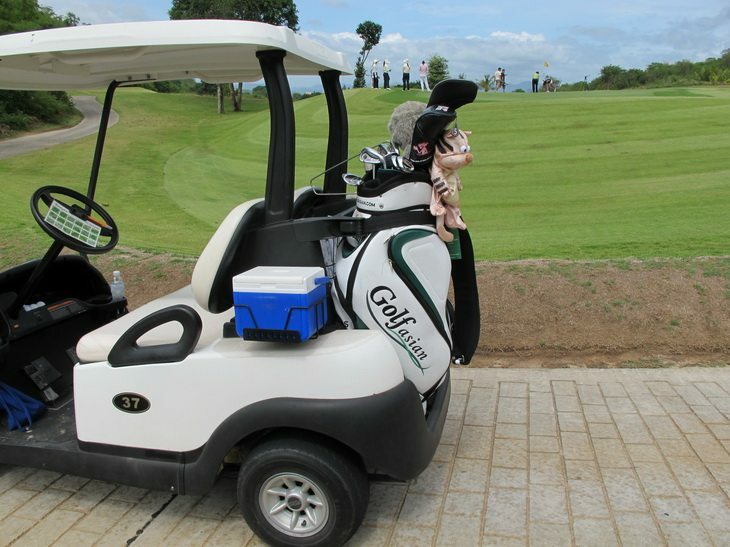 In summary, carts are a necessity for some golfers in Thailand, but if you can walk the course, give it a try. Your game may or may not improve, but I am certain your overall enjoyment and your relationship with your playing partner and your caddy will benefit and enhance o\your overall sense of enjoyment. After all, that is why most Thailand golfers play the game, isn’t it?